Lock in a great price for Caesars Gardens Hotel & Spa - Adults Only – rated 9.6 by recent guests! Excellent staff and very friendly. 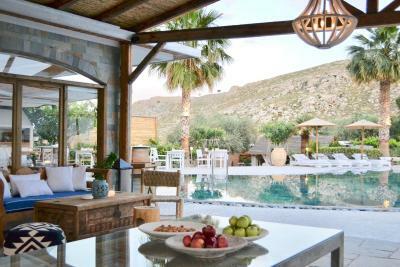 Facilities were great and the Mediterranean suite has a very spacious garden. Everything was perfect! The service was absolutely superb and Valentina was incredibly helpful and friendly. Breakfast was excellent, particularly the omelettes we had most mornings. The bed was super comfortable and the food was fantastic! They also make the best cocktail called a Basil Smash! Lovely hotel. 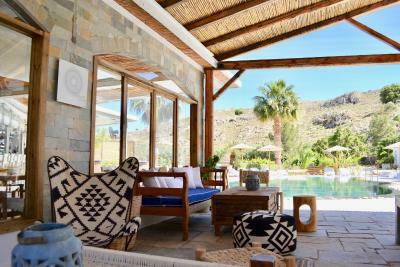 Perfect for us with peace & quiet and lovely surroundings. Lovely staff, very polite and attentive when required but also not over fussy. Quite a walk to the beach but the hotel so nice, you don't really want to leave and can get a taxi if required. From a previous review was concerned that the pool may be too small but I didn't think so, I think it was big enough. Food at hotel is very good although a little expensive to eat there everynight and maybe a couple more dishes on the menu would be good. Valentina will book and recommend other restaurants for you so they don't mind you eating elsewhere. Rooms are good size and very clean and tidy, with beautiful and tasteful decor. 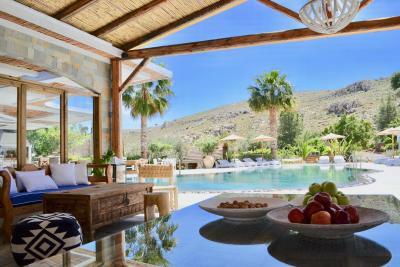 We had a magical stay at the property, such an oasis of calm above the town of lindos. The rooms are beautifully decorated and the setting romantic and calm. 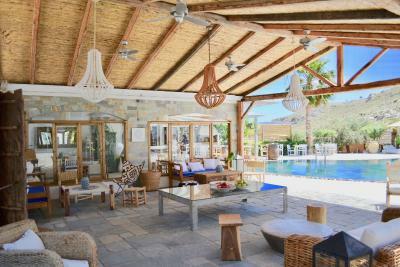 Ideal location to visit many close by beaches and then retire to the calm of the pool in the afternoons. Breakfast and service was excellent and staff were very helpful . The staff is very friendly and welcoming. It is a fairly new hotel and therefore everything in the hotel is top quality and design. Particularly we liked the bed which was very comfy. The room was very spacey plus with a good size balcony. 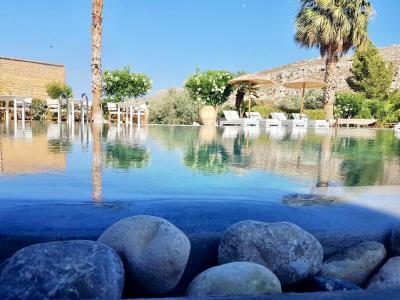 Set amid exotic gardens, in Krana of Rhodes, Caesars Gardens Hotel & Spa - Adults Only features an outdoor spa area, a swimming pool with comfortable sun loungers and a pool bar-restaurant. 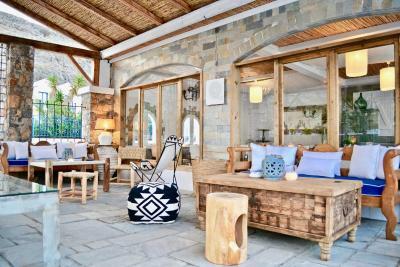 It lies within a 10-minute walk from Lindos’ main square and a 15-minute walk from the beach. 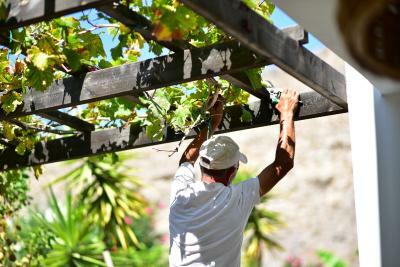 Surrounded by botanical gardens, rooms at Cesar’s have a balcony overlooking the garden or the Aegean Sea. In-room facilities include a hairdryer, flat-screen satellite TV and free Wi-Fi. Other services include a library and free parking available at nearby public area. A range of massage treatments, as well as rejuvenating facial and body treatments, can be arranged at Magnolia Spa. 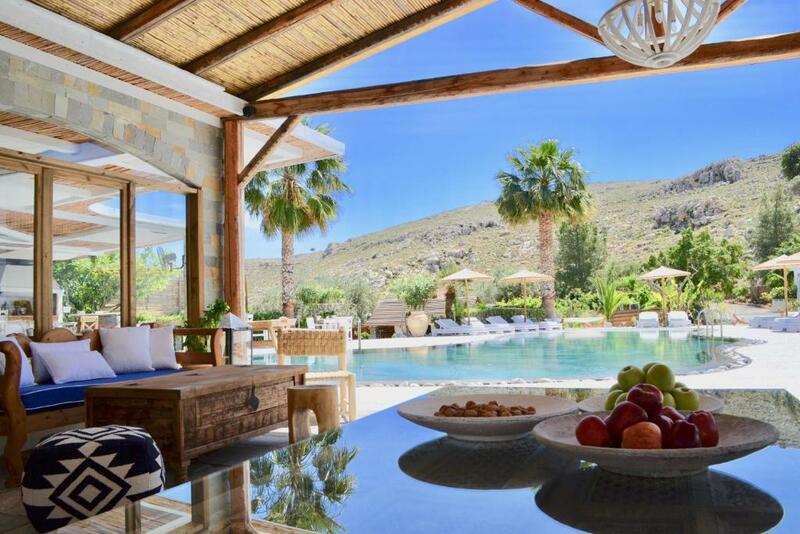 Guests can start their day with a breakfast including homemade jams and fresh fruits, while Mediterranean flavors prepared with organic ingredients are also served at the a la carte restaurant. A wide selection of wines, signature cocktails and other drinks are also served at the on-site bar. Rhodes International Airport is at a distance of 28 mi. 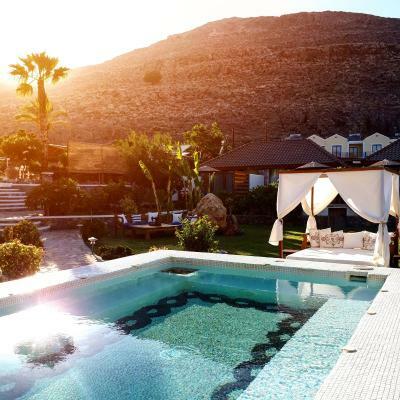 This is our guests' favorite part of Lindos, according to independent reviews. 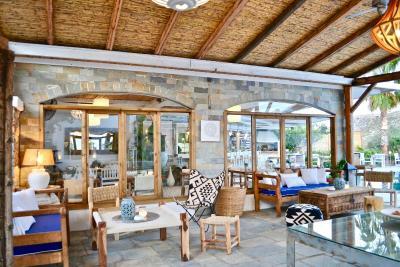 This property is also rated for the best value in Lindos! Guests are getting more for their money when compared to other properties in this city. When would you like to stay at Caesars Gardens Hotel & Spa - Adults Only? 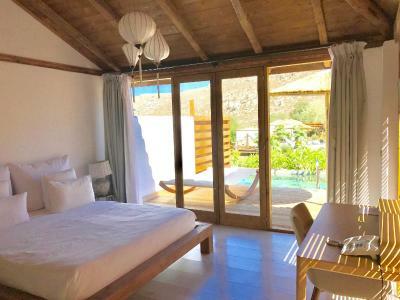 This room offers Acropolis and sea views. 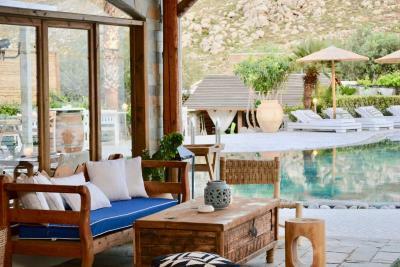 Blending stone with wood, this traditionally decorated suite features an outdoor, private pool. Kindly note that this room type cannot accommodate an extra bed. This bungalow has a balcony, iPod dock and hot tub. Set in a peaceful environment amongst exotic gardens and surrrounded by the Krana hills, Caesar's Gardens Hotel & Spa has a sublime location for relaxation and rejuvenation. 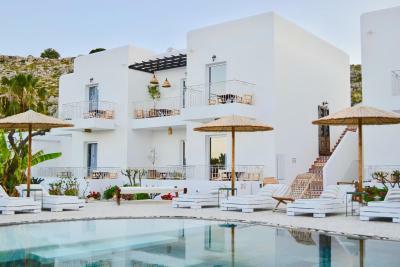 Sophisticated design and distinctive Aegean architechture, along with impeccable service makes this boutique hotel idyllic for an inspirational getaway and a unique holiday experience. 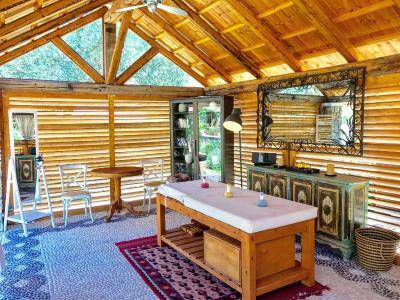 Indulge your state of mind and body at the only outdoor wellness center, The Magnolia Spa, and receive an awe-inspiring tranformation by our highly-trained beauticians and masseuses. 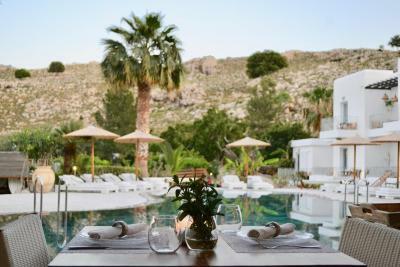 Explore your senses at Tárate and let us take you on a journey across the finest delicacies of the Mediterannean cuisine. 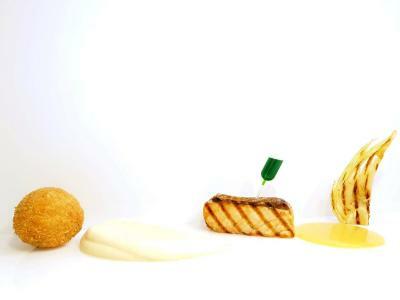 Amuse your palate to gourmet fine dining, our signature cocktails and distinguished wines. House Rules Caesars Gardens Hotel & Spa - Adults Only takes special requests – add in the next step! Caesars Gardens Hotel &amp; Spa - Adults Only accepts these cards and reserves the right to temporarily hold an amount prior to arrival. Caesars Gardens Hotel & Spa - Adults Only accepts these cards and reserves the right to temporarily hold an amount prior to arrival. In terms of facilities we were expecting some more (at least a bigger pool). SPA area was also very limited (there was only a small Jacuzzi) . We could barely spend any time at the hotel, as during the day it was too sunny and the pool was not big enough to swim. So we had to hit to the beach almost every day. It was our honeymoon and we did not receive any special treatments except a bottle of Prosecco from the house. In terms of price value, we could have received a much better service/treatment at many other hotels. Restaurant menu, we thought, was a little limited for our dining palette, some would like it though. We ate in the hotel restaurant I think twice in the evenings and twice over lunch over 10 days, if I recall correctly — but there is so many places to eat in Lindos, and the hotel manager made several recommendations that we tried, all good, which on comparison tended to suggest that the hotel price was a little on the expensive side — but then, the dining experience at the hotel easily compensated. There was one or two other very minor things, but so minor I've forgotten them, and they wouldn't stop me going back nor worth mentioning to staff at the time. Caesars Garden was a very nice tranquil experience. We had the Executive Villa, with a small splash pool, which was very nice to use occasionally after 8pm when the main pool closed. The air conditioned rooms were excellent, bed super comfy. Patio decking was a decent size with the splash pool, nice! We had the mini bar, which as as a rule mu partner and I tend not to use, because usually such items are expensive ... but, some people love that facility and it is there. I had the occasion to wash a shirt myself, dried easily in the heat of the night outside and we had an iron and ironing board provided, but could just have easily paid, I think it was 3 or 4 Euro to have the shirt cleaned in the hotel. Our villa had a walk in clothes closet, nice, and plenty of storage space, etc. Bathroom was large, well laid out with his and her sinks, ... very practical and spacious. Breakfast included was very, very mice. plenty of choice, and the Greek yoghurt, nuts and honey is to die for. 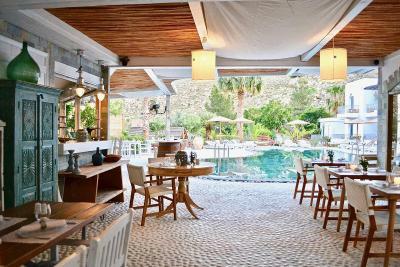 Breakfast is taken in the restaurant/bar area by the main pool and the setting is extremely nice and relaxing. All the staff, and the manager, were extremely nice, lovely people, everyone. The serving staff were so attentive, but not over baring. We ate in the restaurant 4 times in total, and the choices bar on were excellent. For example, the ink squid Tarama was the best. The Lamb Chump was done to perfection. However, the Short Rib beef needed more slow and longer cooking. But, hey, the dining experience is great. A massive bonus was the provision of beach towels regularly changed. The manager arranged our hire car, and organised cancelling our return to airport taxi, as we had the hire car — manager was so helpful. I could go on, but we choose this hotel on a recommendation, and we are glad we went. Highly recommended! Everything about our experience at Caesars Garden Hotel and Spa was perfect. The staff were extremely welcoming and nothing was too much trouble. We stayed in one of the the Mediterranean suites - very spacious and had gorgeous decor. 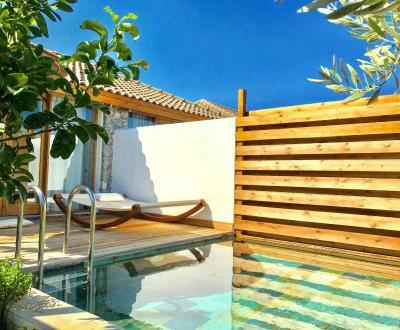 The private plunge pool was the cherry on the cake! The hotel itself was stunning. The main pool and bar area were very relaxing (the photos don’t do it justice - completely exceeded our expectations) We will definitely return to enjoy more time at Caesars Garden hotel and spa! The location was close enough to Lindos to walk which suited us. The staff (in particular Valentina the GM) were outstanding - friendly attentive and made you feel valued. The outside areas of the hotel was as cared for as the rooms and guests making the ambience of the hotel one we didn’t want or need to leave. Honestly.... nothing it was perfection! 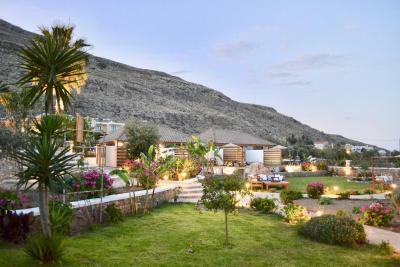 This place really is a little oasis in Southern Europe The Staff: were extremely attentive, service was impeccable..always!! The Food: Breakfast included was delicious...real five star mix of continental and cooked. The dinner menu was also a real fine dining experience that was extremely tasty! Lunch was also a great choice highly recommend the Caesar Salad just relish!! Cocktails AWESOME highly recommend frozen strawberry daiquiri... The Room: 402 We had a luxury room with a private pool, it was just delightful. The beds extremely comfortable, spacious room for cases and all clothing. The bathroom was a gorgeous tropical rain shower open space wet room. 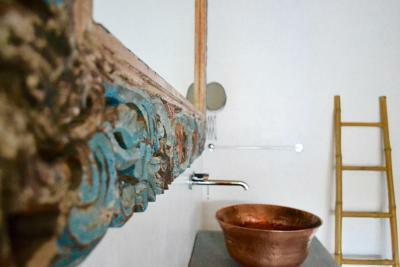 His n Her sinks and gorgeous organic products supplied. The pool is cleaned every morning, which is great and honestly, this was such a lovely luxury addition to your room to chill with a book in hand. The Spa: Delightful visiting therapist I indulged in hot stones massage and was truly exceptional, relaxing and a really zen morning! 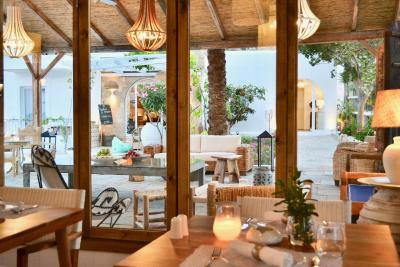 Restaurants recommendations: Caesars restaurant in Lindos was again spectacular the sister to the resort.. a must do! We can honestly say this was a world class resort making a superb holiday and will be back again in the future..... 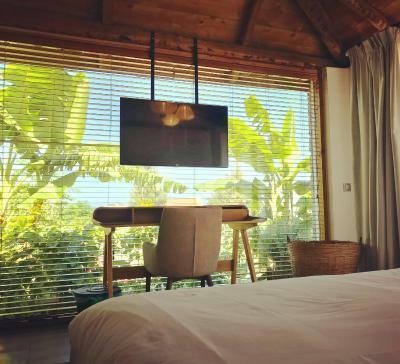 Finally a special mention to the FANTASTIC manager, Valentina, she made our holiday completely relaxing, really making sure nothing was too big an ask from recommendations to directions to general chit chat always making time for every guest.. Thank you! The wifi was a bit temperamental but it didn't bother us much. We had a wonderful stay at this hotel. The hotel grounds are beautiful and the atmosphere is very relaxing. The whole hotel was spotlessly clean and the pool area was very nice with lots of sun beds to choose from. The food at the restaurant was very good for lunch and dinner and there was a lot of choice for breakfast. The staff were very friendly and attentive and were happy to help with restaurant recommendations, booking taxis/trips etc. The location was also good - about a 15 minute walk into the town. 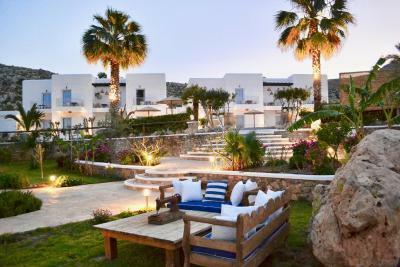 If you are going to Lindos we definitely recommend this hotel! 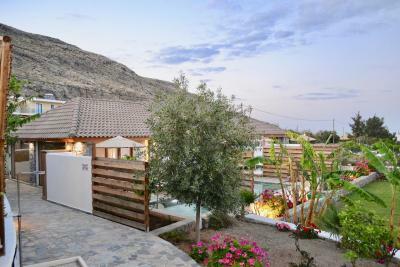 The hotel is situated in the rugged hillside at the top of Lindos - it's a beautiful location. Customer service is amazing - Valentina and all the staff are brilliant. The pool area is not crowded - there are lots of options for sunbathing if you like to lie by the pool Food is amazing too. 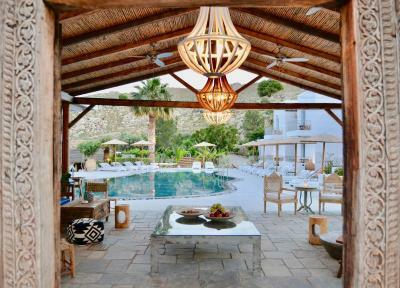 The only slight negative is the lack of shade around the pool with the parasols not being adjustable. Staff were absolutely wonderful! Valentina is a fabulous manager and is clearly passionate about the hotel. The waiting staff could not have been more helpful. Very classy feel to the hotel and pool area! Decorated to a very high standard throughout. Room was very comfortable and clean - could not ask for more. Food was excellent! Walk in shower would be lovely instead of shower over bath. Beautiful pool and gardens. Felt like home.